Pinnacle’s Martial Rangers program caters for primary kids ranging from 7 – 12 years of age and has been a successful program with our students. This program has been such a success that we already have students who have gained their black belt’s within the Mini Rangers Children’s program. 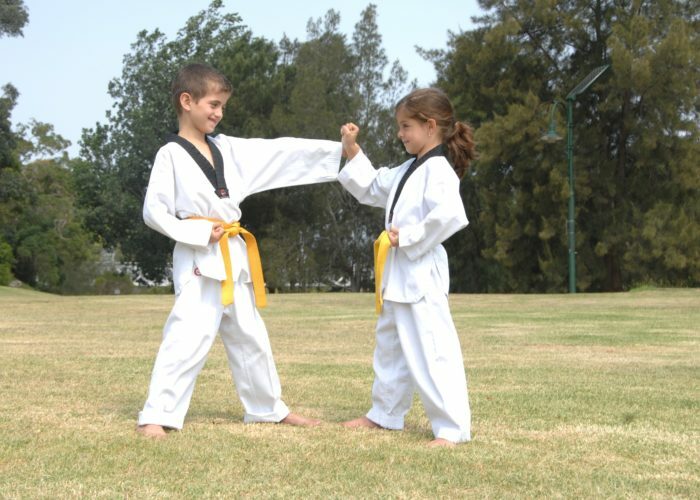 This is due to the successful Kids Martial Arts programs and latest training methods and techniques that has allowed Pinnacle students to progress through the ranks at high speeds with confidence, skill and ability. The Pinnacle Martial Arts Kids Programs are specifically designed to address and improve the physical development, Character development, Fitness, Flexibility, Balance, Co ordination, Discipline, Self Defence, Confidence and Martial Arts Skills. The Pinnacle kids Martial Arts in Marrickville Inner West and Chester Hill, Bankstown Area South West Sydney is a unique mix of Kids Korean Karate, training in the popular Martial Art of Taekwondo, specific kids Self Defence methods, fun basic Boxing & Kick-boxing combinations, Kids Kung Fu influenced Martial Arts and selected techniques from various popular Martial Arts. The students’ progress isn’t without hard work and dedication but we feel that through our program we have been able to achieve the competitiveness to win medals at local, state, national and international competitions. Martial arts is an excellent cross training sport that will greatly compliment the performance, balance, stamina, and concentration of any athlete in other sports outside of Martial arts. In turn we feel that other sports, outside of Martial Arts, are a great advantage and serve to compliment Martial arts. The Kids Martial Arts programs we offer focus on building the child’s confidence, discipline, Respect, self-esteem, self-control, balance, power, strength, speed, agility, motor skills, Health, focus, Fitness, determination, problem solving, team work, communication skills, concentration though specific Kids & Teens Martial Arts and Self Defence in a structured, fun, motivating, safe family friendly environment. Check out our service areas where we offer our services. INTERESTED IN OUR MARTIAL ARTS CLASSES IN MARRICKVILLE & CHESTER HILL SYDNEY?